"Disable:Windows 8 Metro OR Windows 8 Start Screen"
But it seems some Windows 8 users are having issues with the new Metro interface. 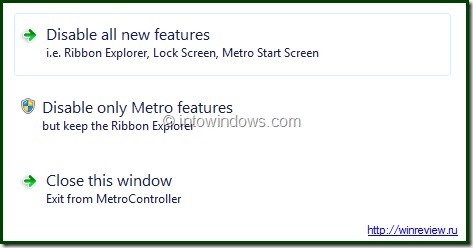 If you are one of those who are trying to get rid of the new Metro, here is a small application that helps you disable the Metro features such as Ribbon Explorer, Start Screen and Lock Screen. And, if you are trying to get back the good old Start menu, read how to enable Start menu in Windows8. Metro Controller is a tiny tool ,developed by our friend hb860, to disable the Windows8 Metro UI with a mouse click. The tool lets you disable the Windows Explorer Ribbon, Metro Start screen, and lock screen.